// The remaining values are not in the standard. // Read only after relocation. // The remaining values are extensions used by GNU or Solaris. // Specify the value of _GLOBAL_OFFSET_TABLE_. // Specify the start of the .glink section. // Specify the start and size of the .opd section. // symbol in the symbol table. std::cout << "program table at: " << programTableOffset << ", "
std::cout << "section table at: " << sectionTableOffset << ", "
先把参数按RDI, RSI, RDX, RCX, R8, R9的逐条设置，假使有再多参数就位于栈中. 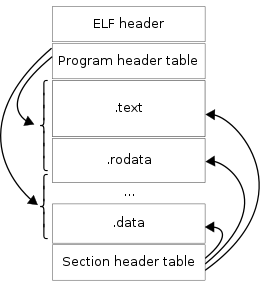 In computing, the Executable and Linkable Format (ELF, formerly named Extensible Linking Format), is a common standard file format for executable files, object code, shared libraries, and core dumps. 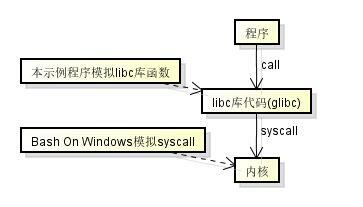 First published in the specification for the application binary interface (ABI) of the Unix operating system version named System V Release 4 (SVR4), and later in the Tool Interface Standard, it was quickly accepted among different vendors of Unix systems. In 1999, it was chosen as the standard binary file format for Unix and Unix-like systems on x86 processors by the 86open project. By design, ELF is flexible, extensible, and cross-platform, not bound to any given central processing unit (CPU) or instruction set architecture. This has allowed it to be adopted by many different operating systems on many different hardware platforms. There are no section groups in this file. The decoding of unwind sections for machine type Advanced Micro Devices X86-64 is not currently supported.